This post is part of the new series “Faces of Plant Cell Biology”. In this series I am going to post answers of plant cell biologists at all stages of their career to a set of five questions. For obvious reasons I expect this to at first feature researchers which I know quite well, simply because I hope that they will be more willing to complete the questionnaire! However, by no means this should indicate an order of importance and I am very keen to feature as many researchers as possible. If you are a plant cell biologist and would like to to see your answers here, please email me at anne@plantcellbiology.com. 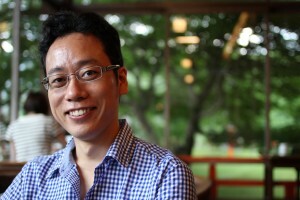 For today’s post I have managed to convince Dr Kentaro Tamura to answer my set of questions. Kentaro worked in our lab a few years ago and is now based at the Department of Botany, Kyoto University (http://www.bot.kyoto-u.ac.jp/e/index.html), where he studies the plant nuclear envelope. I have been working on organelle dynamics in plant cells. Recently I have been focusing on the structure and function of the nuclear envelope in supporting the plant life cycle. The nuclear envelope is an indispensable structure to wrap up chromatin DNA, which encodes an organism’s hereditary information. So it is really important to understand how plant nuclei build their structure and keep their genetic materials safely. It is always exciting to see experimental results. The longer I have been struggling to get them, the more I feel rewarded. Getting to meet various researchers having different backgrounds from mine is also a wonderful moment for me. The wWorst thing is long desk work which sometimes gets me frustrated. When I was an undergraduate student, I happened to choose a laboratory studying plants. This was a starting point for my career as a plant scientist. During my PhD course I got absorbed in fluorescence microscopy for seeing the beautiful and dynamic world of the plant cell, and then I desired to study further plant cell biology. It is also important for me that many people have helped me to get to where I am now. To be honest, once I step outside of the laboratory I can easily get my mind off work… Playing the guitar, traveling and reading books always makes me feel relaxed. I would like to refer a comment of Dr. Hamming. “Leave your door open”. The one who leaves the door open gets all kinds of interruptions, but also occasionally get clues as to what the world is and what might be important. Please develop the kind of receptivity to welcome any opportunity which may come around. 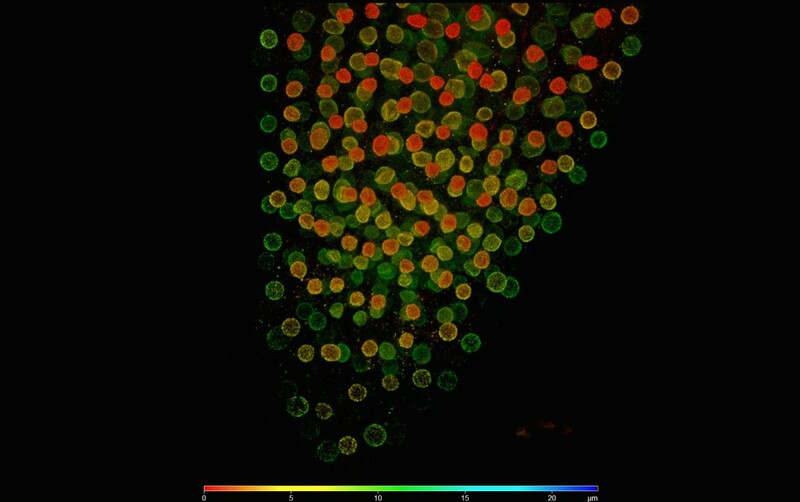 Green: nuclear pore-targeted GFP (nuclear envelope). Magenta: Histone-RFP (chromatin DNA).